EL VALLE DE ANTON: Down, way down, in a valley surrounded by mist-wreathed mountaintops near this comfortable community, are the red tile roofs of miniature homes. But they are not in a valley and they are not so small, they are inside the 20 square kilometer crater of a volcano atop a mountain, the second-largest inhabited extinct volcano in the world. 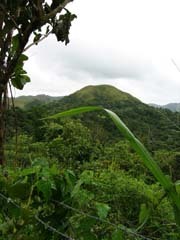 Surrounding them are sheer-sided, jungle-covered peaks that rise a further 600 feet. They are actually the rim walls left in place when the caldera collapsed and became the flat valley floor. El Valle de Anton residents sleep peacefully. The last geological activity was 32,600 years before Christ walked the earth. They live in an area of spectacular scenery and in which almost anything will grow. So fertile is the soil that ranchers’ fence posts grow leaf-laden branches once they are planted in it. 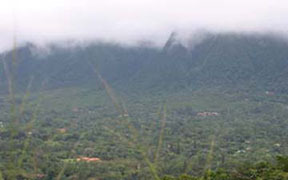 At some 2,000 feet above sea level, El Valle de Anton and its surroundings is cooler and less humid than at lower elevations. That makes it a popular residential area with both Panamanians and retirees from other parts of the world, and there are some fine homes here. Late evenings are sufficiently cool that long sleeves or a light jacket might be more comfortable. Year-round average high temperature is 20° C (68° F), and the average nighttime minimum is a comfortable 16° C (61° F), with little variation between summer and winter. In the province of Coclé, near the border of the province of Panama, El Valle de Anton is reached from the Pan-American Highway via a two-lane, winding road that rises gradually through breathtaking scenery for its approximately 25 km length before dropping sharply into the village. The drive from Panama City takes about two hours, but allow more for stopping to admire the views and to take photographs. El Valle de Anton is a peaceful town of neat and colorful gardens and many large homes. 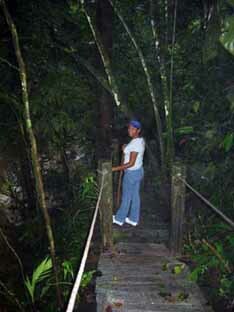 It is also, like much of Panama, a meeting place of two worlds. At a private zoo and botanical garden, a young guide offered to lead our party. He was 13, and made his living as a guide on weekends when he was not in school. He lived with an aunt. His mother had moved elsewhere to find work, his father had abandoned him and his younger brother. The boy averaged about $6 a day on good weekends, money he spent on food for himself and his brother. El Nispero plant nursery and zoo is a popular destination with tourists. Admission is $2, and the place is open from 7 a.m. until 5 p.m. The zoo contains monkeys of different varieties, birds of many colors, a large assortment of animals most of whom seem to welcome human companionship. 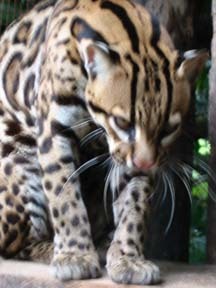 But, unlike Summit zoo on the outskirts of Panama City, this zoo does not limit itself to Panamanian wildlife. A rather surprising sight is the grinning face of an ostrich hoping for a tasty morsel. Signs point the way to an enclosure housing the tiny golden frog, the emblem of Panama. Like frogs the world over, the numbers of this one-inch specimen have been declining and it is no longer easy to spot in the wild. Using modified techniques used in spelunking and canyon rappelling, galvanized steel cables and pulleys connect a series of five platforms high above the rainforest floor. They pass trees in place since Christopher Columbus discovered America. One hundred and eighty feet above the ground, the ride crosses El Chorro Macho, a spectacular waterfall that ends in a small pool that El Valle de Anton locals claim is enchanted, the water curing all ills of body and soul. From the platforms are unusual views of tropical forest wildlife, some 70% of which lives in the canopy, one of the least understood environments in the world. For those who do not like heights or who are over 200 lbs, there are trails and guides to take you along them, pointing out medicinal plants, birds and animals. 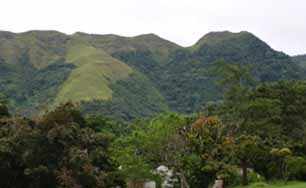 Also on this end of El Valle de Anton: La India Dormida (the Sleeping Indian Woman) mountain. According to local legend, a young Indian princess fell in love with a conquistador. Her father disapproved and refused to allow the princess to marry the Spaniard, whereupon she lay down and died. Dust covered her body and grew into a mountain. 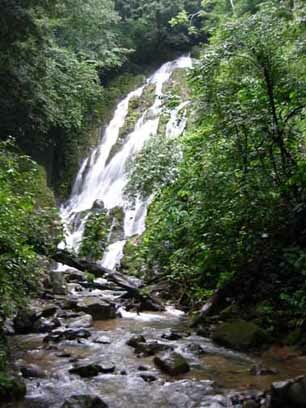 There are thermal wells in El Valle de Anton, their sulpherous 40C water said to have beneficial effects on the skin. There are two types of mud, one said to work wonders for acne and other facial blemishes, the other for the body. A guide provides a tour which includes a visit to the farthest end of the property where, on a piece of plywood, he jumps up and down. The ground for many feet in all directions shakes like Jello. He explains that a few steps beyond where he stands are deadly quicksands. The small crowd jumps, the ground quakes, and we are glad to have been told not to venture farther.